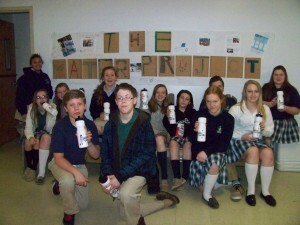 Our upper school student's have been studying the Chesapeake Bay Watershed. We have now expanded to studying environmental issues such as water pollution locally and globally. I have incorporated not only science but agriculture, geography, technology, mathematics and engineering. The Water Project lends itself perfectly to my curriculum. With this project students are map reading, studying other cultures, budgeting, calculating, creating, problem solving and learning all about our most valuable resource.. water. As part of this unit I want to encourage students to realize that they as individuals can create change from where they are at on a global level. This project allows students to see exactly how and where their funds are being utilized. We hope you will let students know that together we can make a difference by giving the gift of not only water but of Christ like love for our fellow man. 04/02/14 Meredith Weiler-Skirka $350.00 Thanks Joe,Sydney,Hannah,Hannah, Kaleigh, Ben, Sarah, Kierstyn, Maya, Gary, Leah and Sara.